It started with the skull and crossbones which is a cool looking symbol in itself but my skull and crossbones is not pirate related although one of my ancestors was a privateer. It starts with the Templar Knights who were often used to transport important people safely on a long journey. What was seemingly becoming a trait, we kind of lost touch with SBG but not before I met Leo Kirby, we kind of hit it off right away, I guess being the same age group we had that old man cynicism. Leo had started training with Marcelo after he had persuaded Marcelo to move to Florida. At one point there was just Marcelo, Leo and 2 other guys training in his garage and Leo was getting a lot of information. He would email me daily with new techniques, ideas and Marcelo's philosophy on everything. I learned so much from that correspondence, most of the emails I have kept to this day. 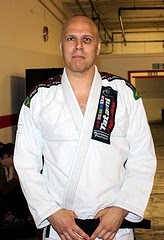 I even added "Leo's Page" to the old www.combatsport.co.uk website, I don't know if anyone saw it but he laid out Marcelo's game totally complete with links to matches to fortify what was being taught. That in itself was a great resource, I wonder how many people actually saw it? Up to this point, this had been a very satisfying period for me and yet one that can never be repeated. There is so much BJJ now in the UK that no one will have to go what we went through and because of that I am sad for you. These days it is easy to get access to great coaches, the group is full of them, YouTube and torrent sites fill in any knowledge gaps but when there were just guys like Helen, Muckle, Spenna, Danny and Ryan with us trying to work things out, that was real fun. I don’t understand some people’s rush to get through belts because they really are missing the point. So here we stand, 7 black belts so far with plenty more on the way including the 1st female in the UK, something the big G can never take from us. We have the structure to keep providing opportunities for our students. We have mma, gi and no gi champions with guys that have competed from every level from local interclub to Mundials and everything in between. All this has been achieved without having to sell our soul to a franchise, this has been hard work from everyone involved and for that I am very proud. Knowing that I also have Haueter there to call on too if I need any advice, which I often do. He has helped me a lot with the various problems you encounter along the way. I have been fortunate to travel, train and teach in a bunch of different places, home and abroad, have met some truly wonderful people and had some great experiences through Jiu Jitsu. So this gives me the inspiration to try to help others. I am so pround that as a group we have raised thousands of pounds for charities, really giving back to the community that so many just take from. For ourselves, our legacy is we are providing a friendly yet competitive environment for anyone to improve their lives through improved fitness, confidence, social skills and of course defensive skills. BJJ tourneys were not yet to hit the UK so we dived into competing in Ju Jutsu Kumite that had been started by a group called NJJKC under the guidance of a guy called Ross Iannocarro. Ross was an exceptional martial artist and all round good guy; he really helped us a lot. IIRC he also turned down using the Gracie name, he wanted to strengthen his own reputation, not piggy back on someone else’s. 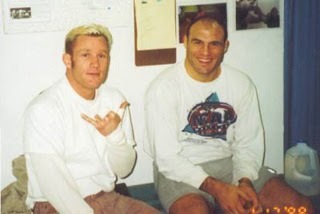 We had trained every chance we could, gone to countless seminars, competed in whatever had any kind of grappling in it and generally just dedicated so much time to Jiu Jitsu then at a seminar with Haueter (I think 2000 but not 100% sure) we were rolling when he asked “has anyone promoted you before? Even one stripe” I said no, he was my professor now and I was waiting for him. So he promoted me to blue belt and to make things even better, Helen was promoted too. We then threw ourselves more into training than ever; did loads of seminars, had guys come to our gym to put on classes and listen to their stories and yet they seemed bound. We were offered affiliation to the big franchises but it just didn’t appeal joining someone else, the franchises were really controlling but Haueter’s Jiu Jitsu was free. I wasn’t bothered about success by association so we decided we would start our own team; especially as the relationship and opportunity to train with Andy was diminishing. We formed San Gokui, a Japanese phrase meaning “three principles” we used this name in part as a sign of respect to the Japanese martial arts we had been recently practicing but also I liked the appeal of the 3 principles, these been mind, body and spirit. 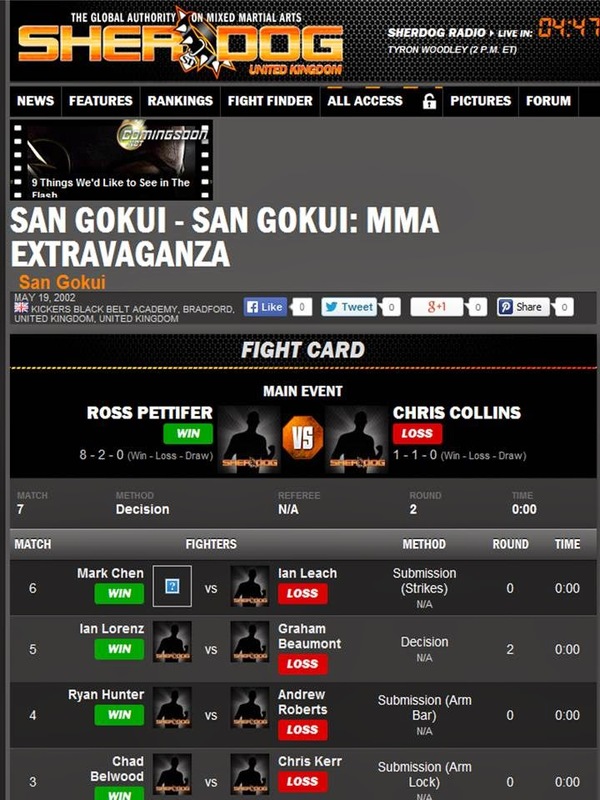 Notice Ryan Hunter on the fight card? Due to a “miscommunication” we missed the chance to train with Chris Haueter for a year or so but that gap was filled in part by Matt Thornton, the tallest guy ever, president of SBG and one of Haueter’s brown belts at the time, Matt insisted on us doing no gi too,something I wasn't bothered about at the time but see the value of it now. Matt became a regular visitor to the UK bringing with him other talented martial artists too, John Frankl to name but one. John showed me a couple of half guard things that revolutionised my half guard game that I still do to this day. I also remember him arm dragging before it was a part of everyone’s arsenal. As we concentrated on just straight BJJ we founded Combat Base; even though Combat Base was founded by Helen and myself, it gives a healthy shout out to Chris Haueter as he is credited with naming that particular position. It all seemed very apt as we about to move into our first real academy, a base from which to practice combat. I then achieved some novelty value. I had 2 students promoted above me. I was the coach and a blue belt at the time when I had my future wife Helen and Pete Guest promoted to purple belt. I had people all over saying what a brilliant coach I was because I had taught some students to be higher grades than me. The novelty value is I had never met these guys that knew I was such a good coach!! I also got a phone call from someone asking who would be taking the classes now I wasn't the highest grade!! Seriously. One of my proudest days came after training one Saturday when Steve Muckle (who had travelled from Northumberland every weekend for 3 years to train, compete and attend seminars) told me he was officially going to open his own club and wanted to use the Combat Base name. Wow, I was kind of taken aback but very flattered too that he wanted to use our name. I agreed of course so he let me out of his side control, at one point I had my emails routed there Darren@understevemucklessidecontrol.co.uk. Side note – Haueter would mainly be doing seminars at Jeet Kune Do schools as he was a certified JKD instructor from Dan Inosanto himself and a lot of the JKD guys had an affinity with the Machados, probably as Dan had started training there himself. 1999 brought my first meeting with Marco Ruas, a totally world class fighter who had won UFC 7 with great performances of striking and grappling and is considered one of the first guys to be that well rounded. I had also seen a grainy tape of Marco fighting the Gracies top fighter Pinduka. The fight was scored a draw (ha,ha) earning Marco and Luta Livre a ton of respect. This became my introduction to no gi, proper leg locks and anti-Jiu Jitsu techniques. Marco is still one of my favourite guys that I met in martial arts; he gave us quite a bit of time and did some photos with him for Combat Magazine. I have always kept in mind his anti-Jiu Jitsu and practiced my leg locks diligently, some would say to the detriment of my guard passing but whatever, it’s all about the journey. Anyway I would rather have 1 arm lock and 1 leg lock than 2 arm locks. So now, of course, I had to learn grappling. I started Judo and traditional Jiu Jitsu for a start then managed to acquire some back up video tapes of actual fights and instructionals coming out of Brazil and so it began. At this point the internet was not yet in full effect, so videos and snail mail was all we had. So we muddled along trying to piece everything together in the constantly changing jigsaw that was Jiu Jitsu, at the time a lot of the stuff we were doing was a vale tudo nature and involved striking, takedowns and nasty submissions. Professors Trial and Error were always there to offer their thoughts. It had to be noted as well at this point that we had no mats. We were renting a church hall and after going through their cupboards we found an old carpet that we thought would be great for training on. All takedowns were done onto a crappy old carpet laid on a solid wood floor. For one of my fights I had Chris Eastwood throwing leg kicks at me so I could practice takedowns against kicking. Every time he kicked my thigh I clinched and took him down onto the carpet, this was a live drill so by the end of it we were both battered.